There is a popular saying that "don't judge a book by its cover" and that seems to be the best in using to describe Nollywood actress, Ibinabo Fiberesima's personality. The actress has gone through a lot overtime ranging from marital issues, to court issues and AGN's top position, yet she has been able to pull through with the grace of God and she is not relenting in making a positive statement in the industry. Recall that she was sometime in a love affair with fellow actor, Fred Amata and the relationship produced seed until it hit the rocks and both parties went their separate ways. Well, as an art of maturity and care for her ex, the actress has began campaigning for support for Fred as he contest for the seat of the President of Directors Guild of Nigeria. 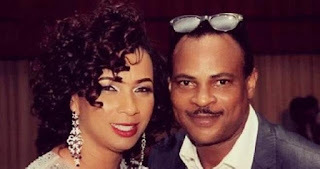 Not might likely have such a soft heart especially considering what they might have gone through in the hands of their lover in the past but Ibinabo has put her past behind her and forge ahead and now she is soliciting support for her once love.